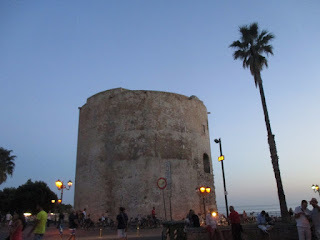 If you want to see a carousel that’s propelled by a bicyclist who high fives screaming children as he pedals then visit Alghero one of the two main cities of the Island of Sardinia. On the same main square, Piazza Sulis, you can also watch a puppeteer who delights onlookers with the delicately exquisite movements of her marionette and this right under one of the ancient stone towers (the Torre Dello Sperone) that populate the town and that at one point provided defenses against invading armies. There are streets named after the famed romantic poet Giacomo Leopardi and the Marxist Antonio Gramsci about whom the Italian filmmaker Pier Paolo Pasolini wrote a poem, “Gramsci’s Ashes.” When you arrive at the airport there's a colorful mural of the city illustrating its battlements and a poster advertising, "endless island," which is, when you think of it, an oxymoron. During the summer Alghero is teaming with tourists who gravitate towards the art nouveau newpaper kiosk with its L’Unione Sarda” on top. Oh yes and if you’re in doubt, sardines are definitely a Sardinian speciality. There's something garish about Alghero with its late night bazaar, which sells all the cheap memorabilia you will never need and street musicians wailing forth in a folk rock style derivative of American pop stars of the 70’s and 80’s. But Alghero is a place where memories are made and where many of the supernumeraries who populated Fellini classics like 8 ½ probably learned their tricks.